I put a picture of Naish on here when he was just a few months old. Now he has grown into such a handsome boy I had to share another picture! He has turned out to be such a good boy and is still so sweet! Thanks to everyone for your kind comments! Keith, I will have to try the dog park you mentioned...see you there. Do you ever go to the dog parks in Rhode Island. I sometimes take my aussies to South Kingstown dog park. Would love to meet up for a play date if you're interested. He is really beautiful. 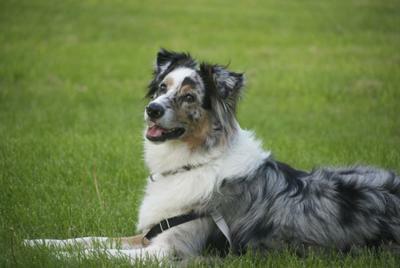 Looks like my female aussie except she has no white on her face. So sweet.